I worked at Symbolics and then MCC selling and marketing AI in the 80s and 90’s, and it was a wild fun, exciting, insightful ride. 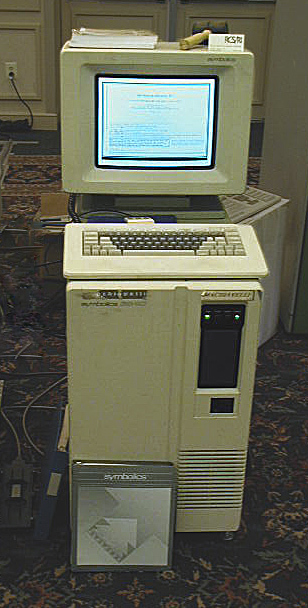 Shown in the picture is the Symbolics 2640 Lisp Machine. Starting price was around $80,000 and then dropped to half that amount, but in the end, we could not compete with Sun Microsystems and then Intel running on PCs: despite the amazing sophistication of the Lisp software and the promise that programmers would be more productive. Neural networks were the thing in the late 80’s and some of those initial technology innovations at MCC were spun off into profitable businesses. Now we computers that are 1000+ times faster and smaller we’re seeing a huge resurgence and a democratization of these technologies everywhere. This brings up a question, what is the right approach to selling and marketing AI, machine intelligence, neural networks, deep learning, big data as it’s introduced into the software we use at work and home. How is your job and your life being impacted as a result? We used to think of AI as a something you developed and ran on an ‘AI machine’ with dedicated hardware for performance. Now AI runs on the ubiquitous cloud-based Intel process amongst others manufactured in the millions for 1/1000 the cost of a Lisp Machine. AI software, for the most part, is invisible to us given so much of it runs in the cloud in large, data centers. Yes, we have edge devices like Siri and Alexa Google Assistant, Cortana and so forth. And we will be using highly sophisticated dedicated hardware for image processing in self-driving cars. But the challenge remains of how to sell and market AI. In the end, it’s not about AI as a technology; it’s about how AI solves a need and makes life better for us to become more who we want to be. Let’s keep our eyes on that idea. The benefits versus the features. And from a more altruistic perspective consider benefits of social innovations the technology enables versus just features of new product inventions. Why? Because selling AI as profit booster by reducing headcount is a slippery slope if the promise lives up to the anywhere near the hype of AI. Personally, I think the emphasis needs to be on how we think and live and educate ourselves with higher levels of insight. This is a promise I find more attractive. Let’s augment our humanness with more advanced machine technology. The reduction of headcount due to automation is part and partial to the introduction of new tools. Fair enough. I’m suggesting a more mindful approach that is a win-win to the employer and the employee. I’m all for reducing the mind-numbing tasks at work provided I have the opportunity to exercise my creativity and insight to explore new ideas for business AND life at home. If this makes sense then consider reading about these ideas further in a book, the Fourth Economy. Or check out a review of this book The Fourth Economy and The Future of Work. It’s going to be interesting to see who the new winners will be in the coming few years. Maybe all of us benefit versus just winners and losers. Call me optimistic if you wish. I’m hoping for better tools that sharpen our ability to find new insights and solutions to complex problems. New AI-based tools that all of us can use, even for free, in public libraries. But I digress for now. As we quoted on the ALPHAGO docuementary, our quest now is to use machines to help us understand how we undestand. That’s a noble cause I can related to because it helps all of us equally. I recently found a news article from the NEW York Times By ANDREW POLLACK, Published: September 13, 1982. In many ways, much has changed with regards to the sophistication of AI but yet in some ways, much is the same around the promise of AI. What hasn’t changed is the challenge of selling something called AI and the worry around the impact it will have in our lives. NEW York Times By ANDREW POLLACK, Published: September 13, 1982. Artificial intelligence, the science of making computers ”think,” has long been the preserve of theoreticians who were little concerned with practical applications. Now, however, business is taking an interest in artificial intelligence, or A.I., and some professors, such as Dr. Schank, are forming or joining companies to capitalize on the expected boom. But the new move toward commercialization is disrupting the academic community and provoking fears that university research will be hurt. ”We perceive there’s a real potential for the existing quality of A.I. research to diminish,” said Ron Olander, who coordinates such research for the Defense Department’s Advanced Research Projects Agency. He made the remark during a panel discussion at the National Conference on Artificial Intelligence, held in Pittsburgh last month. – Vision systems, which would allow computers to interpret satellite photographs and allow industrial robots to identify objects coming down the assembly line. – Natural language systems, which allow people who do not know computer languages to get information out of computer storage by asking for it in plain English. – Expert systems, computer programs that mimic the behavior of human experts and that can do such things as diagnosing diseases and interpret geological data in exploring for minerals. – Equipment and programs used by the artificial intelligence researchers themselves. Xerox and two start-up companies, Symbolics Inc. and Lisp Machine Inc., sell computers specially designed to handle Lisp, the programming language used by artificial intelligence researchers. Several large companies such as Schlumberger, Hewlett-Packard, Digital Equipment and Texas Instruments have formed artificial intelligence groups, to design products for internal use and perhaps for outside sale. Wall Street is starting to take notice. F. Eberstadt & Company, a brokerage firm, has formed a special unit to analyze and possibly invest in companies in artificial intelligence. More companies are being started, many of them drawing people from university research programs in a phenomenon similar to what occurred when genetic engineering was commercialized a few years ago. Yale’s Dr. Schank, for instance, formed Cognitive Systems, which will sell natural language systems. It is designing a system for oil companies that will retrieve information on oil wells using plain English commands. Dr. Schank plans to develop computer programs that can do such things as give expert advice on taxes or wills. Edward A. Feigenbaum, a computer science professor at Stanford University, has co-founded two companies – Intelligenetics, which aims to apply artificial intelligence to genetic engineering, and Teknowledge Inc., which designs expert systems for other companies. Teknowledge is designing a system for Elf Aquitaine, the French national oil company, to diagnose why a drilling bit gets stuck during drilling. Exodus From M.I.T. Already, such university spinoffs have led to strains. The staff of the artificial intelligence laboratory at the Massachusetts Institute of Technology was decimated in 1980 when more than a dozen researchers left to form Symbolics. The company sells computers designed for artificial intelligence that the researchers developed while at M.I.T. About the only two staff research people who did not join Symbolics left M.I.T. to form Lisp Machine, a competing company. ”We took so many that it’s going to take years for M.I.T. to build back up,” conceded Russell Noftsker, president of Symbolics and former director of the artificial intelligence lab. The commercial activity might have some benefit for universities, however. If artificial intelligence is considered commercially important, corporations might finance university research. The Carnegie-Mellon University has signed on several corporate sponsors for its robotics laboratory. Also, the rise of the companies might make it easier for people who want to concentrate on basic research, because pressure from Government sponsors for practical results would be eased. Some of the uneasiness in the university community stems from a difference in cultures. Academic researchers consider products coming out on the market unsophisticated and oversold. An example often given is that of expert systems, the programs that can diagnose diseases or help explore for oil. Although the computer programs are fairly adept at making analyses, they cannot learn from experience. Given the same set of symptoms, for instance, an expert system will make the same diagnosis twice, even if the first one proves wrong. Besides the question of how sophisticated their products are, start-up companies may face a bigger stumbling block – a lack of skill in managing a company and in focusing on specific market areas. They must also hang on until the market develops further and then face competition from the more established companies. ”What’s going to delay A.I. is that there isn’t an infrastructure for developing applied work,” said John H. Clippinger, president of the Brattle Research Corporation, a consulting and market research firm in Boston. Those same problems afflicted genetic engineering companies formed by professors a few years ago. For lack of management talent, money or products, many of those companies have fallen on hard times. Some predict a similar shakeout in artificial intelligence.